Electrical cables in the food and beverage industry are constantly exposed to a variety of abusive environments, such as constant washdowns, harsh chemicals, abrasion, heat, cold, flexing, constant motion and impact. The connectors are frequently submerged in liquids, yet still need to keep the motors operational. Downtime, labor, material and product waste costs can become very expensive. One way to avoid costs, stay ahead of the game and keep your facility up and running is to evaluate industry trends. Looking at current food and beverage industry trends can help you plan for the demand your facility may need to compete with. If your company plans to increase production or introduce a new line of products, for example, you will need to ensure that the electrical cable inside your machinery will keep up with demand. Regulatory demands are increasing. According to the KPMG 2014 Food, Drink, and Consumer Goods Industry Outlook Survey, 22% of food and beverage executives believe that navigating regulatory changes will consume most of their time. This means you may need to dedicate additional personnel to maintain compliance. Unfortunately, ignoring the need to address regulatory obligations can be dangerous as you subject your company to high penalties, bad public relations or worse. With that being said, the possibility of added costs with hiring more employees can quickly come to fruition. You can compensate for those costs and reduce plant downtime, for example, by keeping your machines stocked with longer lasting electrical cable and connectors. Food production only continues to increase, which requires many facilities to make sure that there is enough equipment to handle the higher demand. Additionally, facilities will need to ensure their current machinery is up to date, and regularly maintained. Having high performance replacement electrical cable readily available to maintenance personnel will help increase production and cut away downtime. Commodity sootblower cables, for example, commonly break down and become unusable from the extreme heat and steam that they are exposed to within boiler applications. Downtime can easily be avoided by stocking three to five plug-and-play replacement sootblower cables that are manufactured with better properties, like those that are longer lasting, lightweight and universal (no need to worry about a left or right coil). Consumers are increasingly realizing that the lack of health and wellness in their diets can no longer continue. Food and drink offerings, like genetically modified organism free (GMO-free), vegan "meats", hemp, gluten-free, healthy frozen and individually packed (single serving) products are in higher demand than ever before because of consumer health concerns. This continues to dominate the food and beverage industry with a fury. According to the Institute of Food Technologies, 60% of consumers prefer the idea of eating food with naturally occurring health benefits. With the consumer's new overwhelming preference to fresh foods over processed, your company may need to address it. Production, recipes and ingredients may have to change to keep up with the new tastes. Consumer trends relate directly to increased food production and keeping up with increased demand for new products can run your machinery down quickly. Staying ahead of demand is key and keeping stock and installing better performing, longer lasting electrical cable and connectors will make sure your production lines run smoothly and efficiently with little to no downtime. 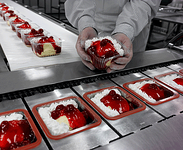 In the food and beverage industry, TPC products are designed for long-term reliability and reduced downtime to meet demanding needs as well as emerging manufacturing trends. Research and development is a continuous process with our engineers, as we are always looking for new ways to improve our products to ultimately benefit our customers. Superior performance is a function of construction design, materials and matching the correct cable to the application. Begin preparing and upgrading your machines for higher demands by downloading the Food & Beverage Cable, Connector & Assembly Guide.